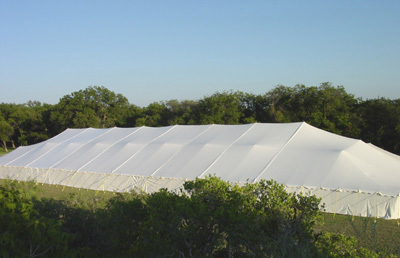 This party canopy tent provides rain, sun, and wind protection for even the largest outdoor events. Practically an event hall in itself, when erected it covers 80 by 220 feet of shaded area. Vinyl top and side walls are easily transported in a storage bag, and the galvanized side poles are both lightweight and strong. An included video gives detailed installation instructions for maximum convenience, and Ohenry Tents provides a one year warranty on construction. Side Poles: 16-gauge steel - 1.660" Dia.